Connect the ULRS Receiver PPM pin to the Flight Controller PPM pin. For an APM, this is on the first RC input channel. 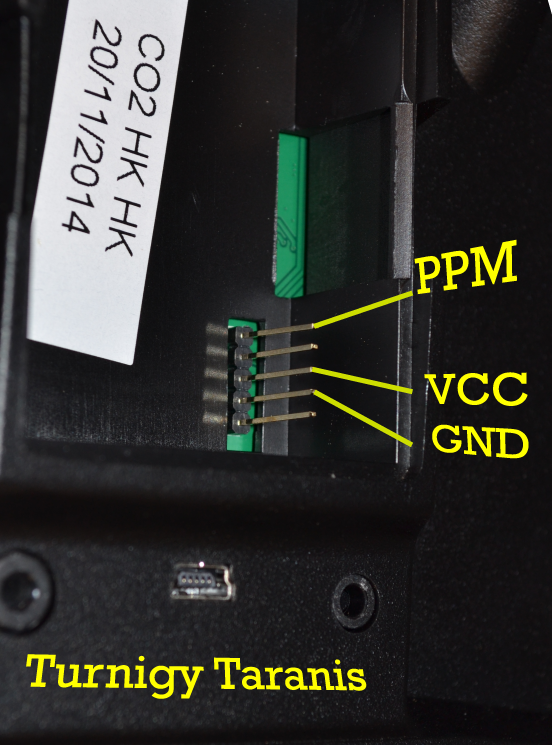 For APM, connect the RC input 2 signal pin with RC input 3 signal pin : this tells APM to listen for serial PPM. Connect the ULRS Receiver PPM pin to the Flight Controller PPM pin. For an APM, this is on the first RC input channel. On a 100mW OrangeRX, the PPM pin is the fourth channel (see diagram). Remember that the serial ports are in opposite direction on the 1W and 100mW modules. Click here to print your labels. Hello, i connected my + and – pins on my 1W orange TX Module directly to the battery, I use it as an RX in my Plane. I connected the “ppm out”-pin to my Pixhawk lite and it got no signal. do i need ground on my ppm plug which is connected to the pixhawk? and when i need it, from where do i get it? could i use the ground of my battery? Hi, first, thank you for this nice project! I have flashed both orangerx 1W modules in TX and RX configurations and they are paired, but when trying to connect 2 PCs with FTDI cable using same speed, all I receive is gibberish. PCs connected directly with 2 FTDI interfaces works fine. I already tried to connect RX and TX pins together on the receiver module, but no difference. Hello, it’s normal, the computer connected on the TX must be connected at 115200 bauds, and the computer on the RX side must be at 19200 bauds. 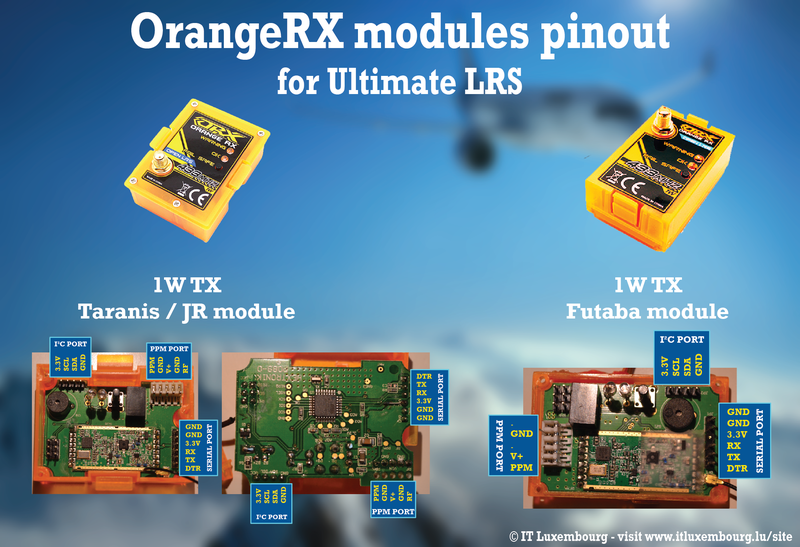 Hi, is UltimateLRS compatible with the OrangeRX 100mW TX module (futaba type) i.e. I intend to use it in the plane as a receiver. (the transmitter will use a 1W JR type module). Thanks for everything! Not yet, but I’m waiting for a 100mW TX and will implement that feature. I have knocked off the PPM cable to the standard orange receiver (not the 1w module) and I can’t remember what pin its meant to be plugged into ? The 100mW is only supported on RX, and with the stable version 1.06, the diagram is shown above, with the PPM, GND and VCC connections. 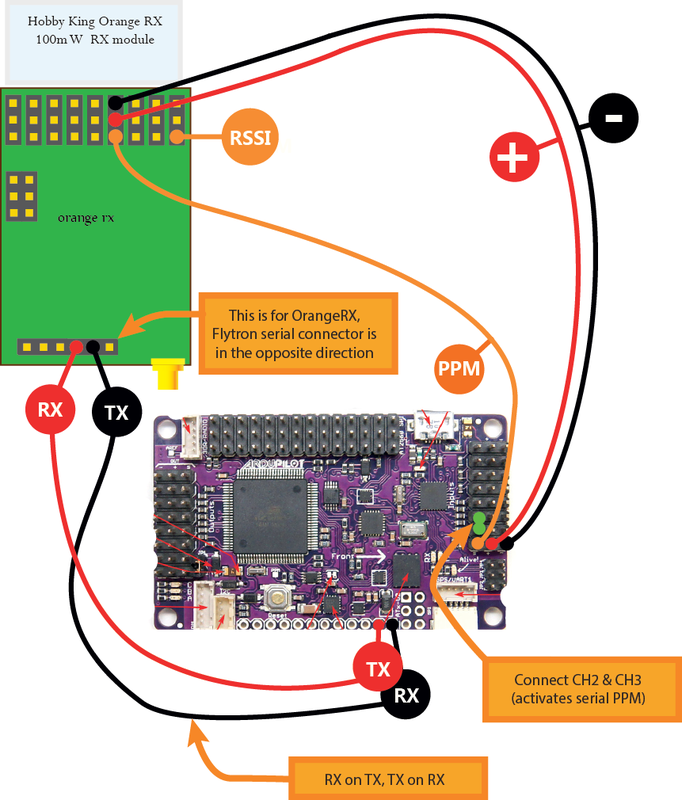 Hey i have question about this diagram i want to use this OrangeRx just for my 433mhz telemetry on APM so i just connect orangerx in rx/tx in apm 3dr radio port ? How to power it up is 5v ubec ok or can i use logic level converter or resistor ?…. Hello, for such questions please use the rcgroups forum as you’ll get answers from many more users. Yes just connect the RX/TX pins to the 3DR radio port (=APM telemetry port). You don’t need a logic level converter, as the 3.3V is sufficiently high to be seen as logic high by the APM, and the 5V from APM is accepted by the atmega328 (which can support up to 5.5V). However you can use a 1k resistor in this line (APM TX to ULRS RX) for more precaution. To power it you can use the main UBEC from your quad (connect as on the diagram, the V+ and the VCC. Don’t power from the serial port’s 3.3V pin, which is after the regulator. ), or directly connect it to the battery. The ULRS has an efficient switching regulator which can accept voltages up to 30V. Ok so on quad i power it via ubec with 5v what about on the ground i power it via ftdi 3.3v ? On TX, just plug into your transmitter, or connect the V+ from the battery, the GND (and the PPM if you need it). Would you be willing to make a detailed step by step setup guide video? I’m trying to wrap my brain around the whole setup. This system is using two txs so I’m confused how the different channels get sent from the transmitter to the apm. Ok, I’ll make a video, let me know if you’ve got a specific question. Notice that the tx modules are actually transceivers : they can act as a rx and as a tx. Thanks for your patience :). Initially I was confused how all the channels would get passed back and forth between the transmitter and the receiver, but then again I didn’t know what ppm was. I looked into it more and it looks like ppm takes all of the channels and sends them as pulses rather than how it’s normally done. That makes it more clear as to why using the one tx as a receiver works. Is the information under “Additional Information” optional? It looks like it, but I’d like to double check. As far as the bluetooth goes, a video for this would be great too. Showing how to connect to the bluetooth with arduino would be a big help. Seeing the process of then connecting a pc with the bluetooth and the end product working would also be helpful. Also I’d just like to say thanks for putting all the time into making this. Once I get this working, being able to having one transmitter and being able to fly multiple machines while using 2.4Ghz for video is going to be fantastic. Not to mention all of my telemetry at my fingertips. You’re welcome ! Additional information is not mandatory to make it work, just clarifies some topics. I’ll make a complete installation video including the bluetooth connectivity. Any plans to enable the channel outputs on the 100mw 9ch reciever? Maybe channel 1-7 for standard outputs and PPM on 8? The 100mW beta will come soon. you’re powering the 1w module off the receiver input pins on the APM/pixhawk. Those pins are on a rail with a 500ma fuse before them and powered from either the power module or esc if you’re jumpering. I’m planning on powering my module through some harnessing directly from the ESC. I’m guessing people haven’t had issues with powering after the fuse. But i just want to make sure that that was known and clear. Thank you for your comment, I don’t recommend to power ULRS through the 500 mA fuse, even if the average consumption is lower. But you’re right, the photo shows the ESC/BEC connected on the output rail, and powering the APM and input rail via the APM jumper. That was an early set up that I don’t recommend. Now I usually remove the jumper and put a servo wire between the input and output rails. Notice that I don’t use the APM power module. I’ll add a paragraph and diagram about these aspects, thanks for your remark ! You can do a preflight test, but I’m 99% sure it will be fine. 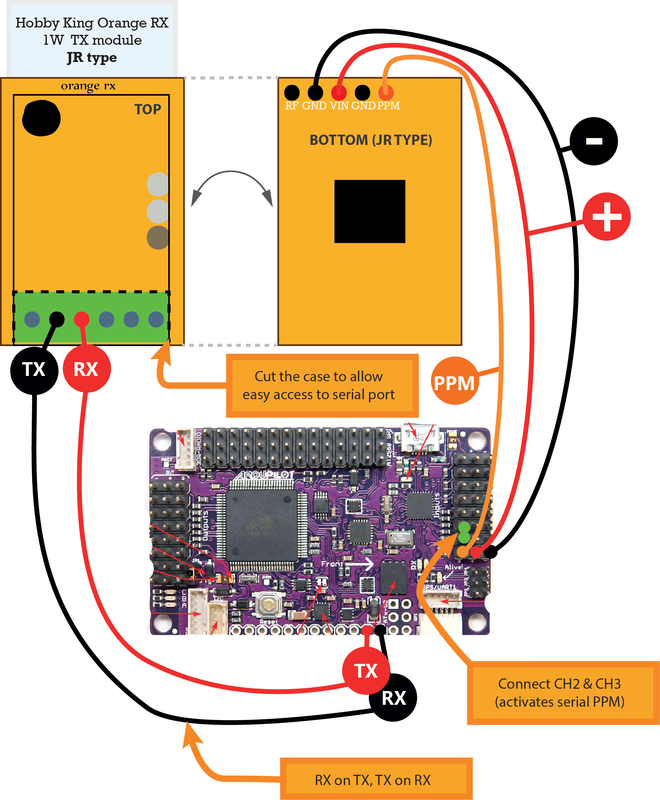 I’m just curious as to why only the diagram for the Futaba-type module shows a connection to the APM UART port or the telemetry port for newer APMs, while the diagram for the JR module only shows a connection to the UART port. Shouldn’t the JR diagram show the alternate connection the the telemetry port as well? You’re right, the JR/Futaba diagram must be updated, in the meanwhile I’ve added an explanation below it. Looks great! A question regarding the e.r.p, can it be limited to 10 mW? It’s the e.r.p limit inside the EU for the 433 Mhz band as far as I know… Do you have/need a special licence otherwise to use a 1W module? Hi, the 1W OrangeRX modules are based on a RFM23BP RF module, which can’t reduce its power to 10 mW. If you need to reduce the power, I would suggest to use the 100mW module, on this one the power can be reduced to 10 mW, or even 1 mW. But you’ll have to wait for the next release to be able to select the power. To answer your question, it depends from country to country, for example in US this system can be used with a ham licence. 1. How can i get failsafe feature when using two 100mw RX modules? 2. Will your firmware works with DIY OpenLRS modules on Si4432 chip? Hi, thanks ! ULRS is targeted at 1W modules, but support also a 1W TX + 100mW RX. Currently it doesn’t support 100mW RX + 100mW TX. To answer your question, it would work with DIY OpenLRS module as long as the pinout is exactly the same. Is it still true? Could I give it a try? I’ve two free of them.